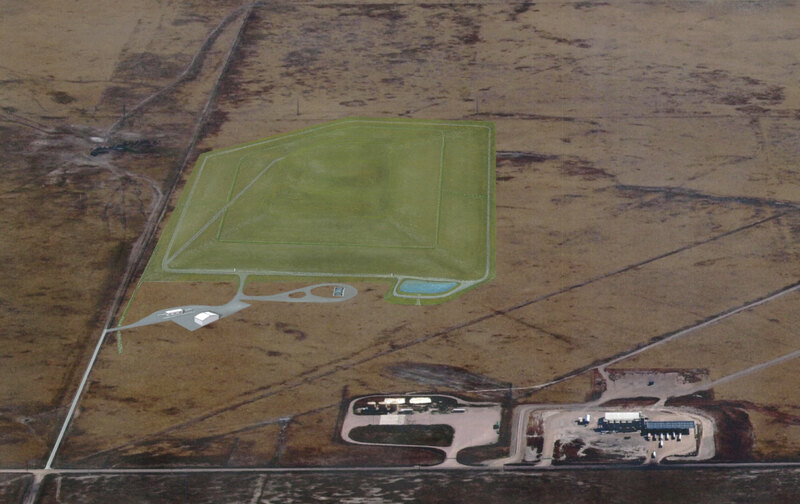 Unlike any waste facility in Colorado, Pawnee Waste’s E&P solid waste landfill is an innovative facility dedicated to the handling of exploration and production wastes. Pawnee Waste is dedicated to responsible waste management that meets an industry need while protecting the environment. Our operations plans and designs are rigorous, meticulous and committed to exceeding regulatory standards. Waste is placed into multi-layered lined cells, and compacted to the smallest practical volume using specially selected equipment. At the end of each day, a cover is applied to the waste. Each cell will be developed sequentially to minimize the area open at any one time. Any water that touches the waste is handled as a waste product and disposed of in strict accordance with state regulation. All waste received by Pawnee Waste is only accepted if pre-approved in accordance with our Waste Acceptance Plan, which has been carefully evaluated and recommended by CDPHE, and permitted by Weld County. The Waste Acceptance Plan is routinely reviewed and updated using site-specific data generated from the incoming waste streams. In addition to waste sampling, Pawnee Waste tracks and records each load accepted from our customers. Pawnee is required to provide safety training for all of our personnel. Pawnee Waste’s innovative facility is designed to protect groundwater by the installation of a high-density polyethylene synthetic liner (60 mil HDPE), a geo-synthetic clay liner (GCL), a low permeability two-foot bentonite clay-enhanced soil liner, and at least 20 feet of separation between the shallowest groundwater and waste. While not required, Pawnee Waste is using advanced technology to perform Electrical Leak Location (ELL) testing of its HDPE liner to ensure proper installation. ELL testing is required in other states and widely utilized because it is proven to be extremely effective in reducing the potential for liner leakage. A comprehensive Monitoring Plan that strictly follows CDPHE requirements has already been implemented, and includes conducting routine groundwater monitoring of established monitoring wells located around the perimeter of the facility. 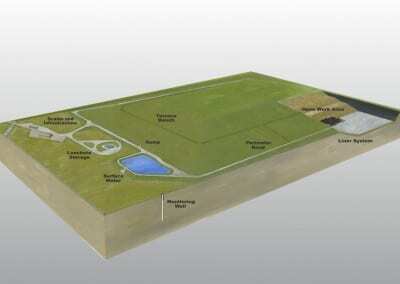 The facility will apply final cover soil in accordance with CDPHE standards that are designed to minimize penetration of rainfall into the waste long after the facility has been closed. Financial instruments to cover the cost of closure and post-closure care are required prior to operation, and must be updated annually. 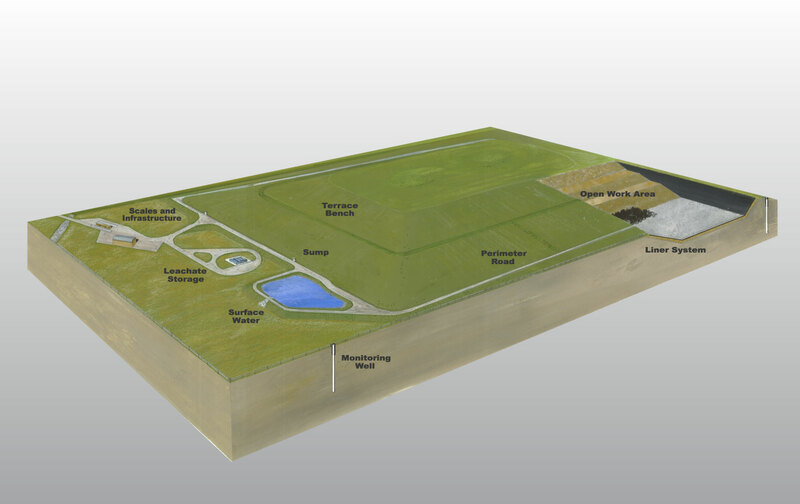 Pawnee Waste’s liner design provides multiple safeguards to protect the environment. We have chosen to exceed CDPHE requirements because we are dedicated to providing the highest level of long-term security for our customers and the public. Electrical Leak Location: This test, which is required in other states, uses advanced resistivity technology to identify liner pinholes, construction related damage or seams that may not be properly welded. It allows any liner defects to be mended before any waste is accepted. HDPE Liner: This high-density polyethylene liner has been proven worldwide to provide a high level of protection to groundwater resources, and is recognized as having the most robust properties to securely contain waste. 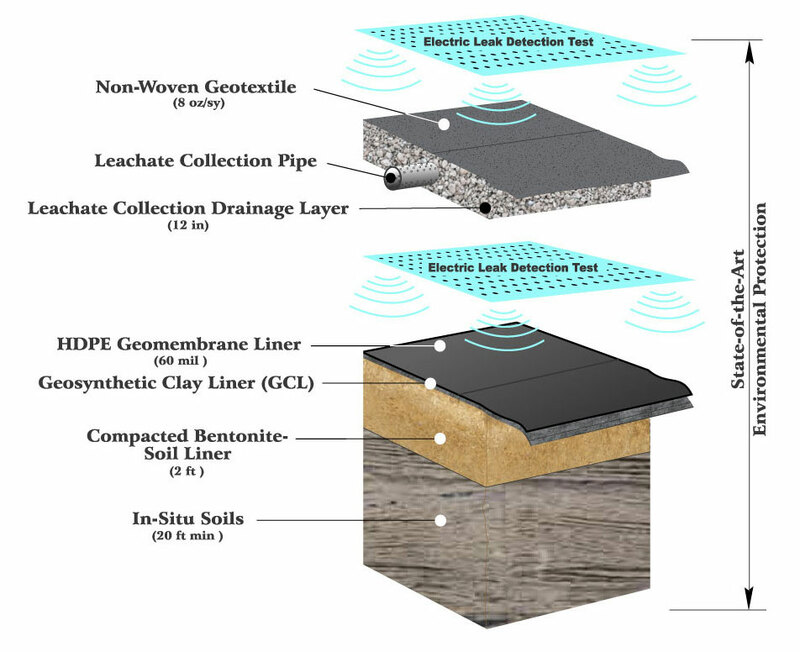 GCL Layer: This geo-synthetic clay liner consists of a bentonite mat encased in geotextile. It is frequently used in connection with HDPE because of its self-healing properties. 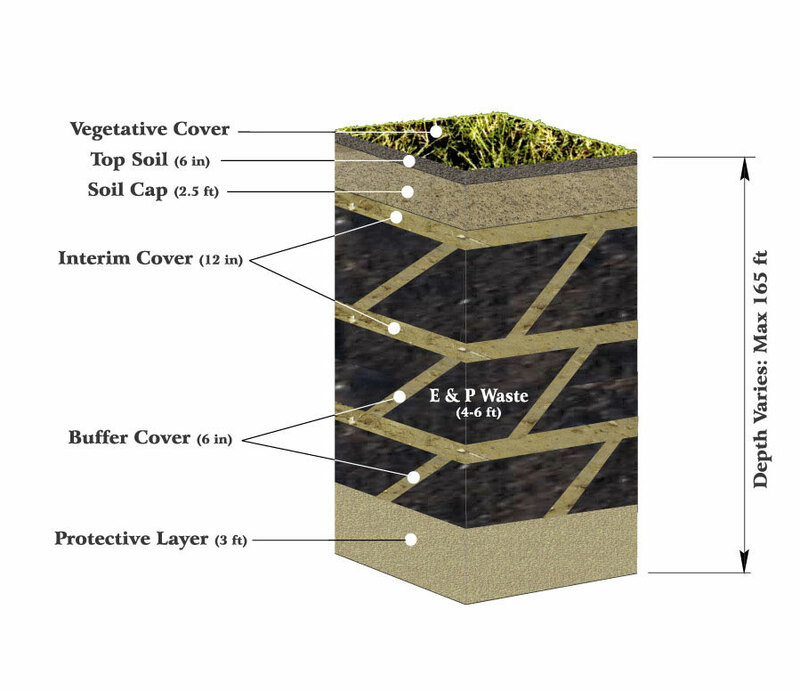 Bentonite-Native Soils Compacted Liner: Many landfills in Colorado are designed using native soils only. 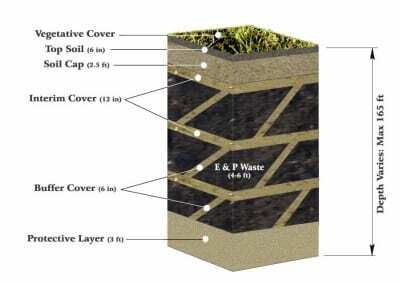 The addition of bentonite to the natural soils ensures that this liner layer will act as a low permeability barrier. 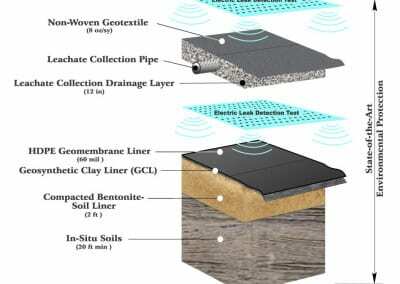 In-Situ Soils: The design provides a minimum vertical separation of 20 feet between the bottom of the liner system and the level where groundwater is first encountered. 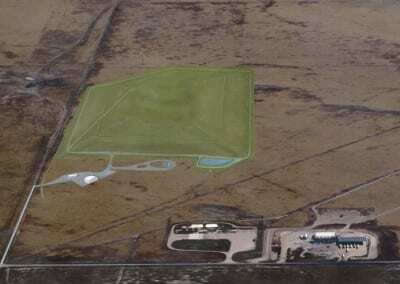 In November 2017, the Colorado Department of Public Health and Environment issued a letter to all landfill facilities related to the management of oil and gas wastes and requirements for the acceptance of wastes that may contain Technologically Enhanced Naturally Occurring Radioactive Materials (TENORM). In general, the letter requires that commercial landfills receive explicit local and state approval for E&P wastes that contain regulated levels of TENORM (e.g., > 3pCi/gm of combined Radium 226 +228 over background). Pawnee is the only landfill identified in Weld County as approved for the receipt of E&P TENORM wastes, including horizontal cuttings. Pawnee’s procedures for screening E&P waste, including that with TENORM, fully comply with the Department’s November 2017 notice. We recommend that generators of the wastes identified above by CDPHE obtain documentation from their select facility to ensure: (1) the disposal site is approved by the state and local governments for receipt of E&P waste with TENORM and, (2) that the facility accepts responsibility for wastes with agreed to radioactive materials as part of the disposal contract. For more information on this letter, please click HERE.